Tucked away in 10th Main Road in Anna Nagar, it is on the road next to RR Donnelley in Shanthi Colony [past Shree Mithai]. Located on the 1st floor, you need to climb up the stone staircase to reach the Tea house. The light, the colours and the space instantly catches your eye. It resembles a small house, with multiple rooms. As soon as you enter, on the right is where the cold stone ice creams are made, when you proceed further inside, you see the counter meant for Tea, displaying containers of varieties of Tea [20 in total], and a blender as well. There is seating in all the rooms, 2s, 4s or more. Apart from these 2, there is a room tucked away with sofas that can accommodate about 10-15people. When the weather is pleasant, or during the evenings, you can enjoy a cup of tea sitting in the outdoor seating area. I wonder if the Metro work noise spills over here, might be a pain. The room had pastel shades of the wall, and beige colour sofas with a huge center table. We were all packed around it, with a few floating in and out. 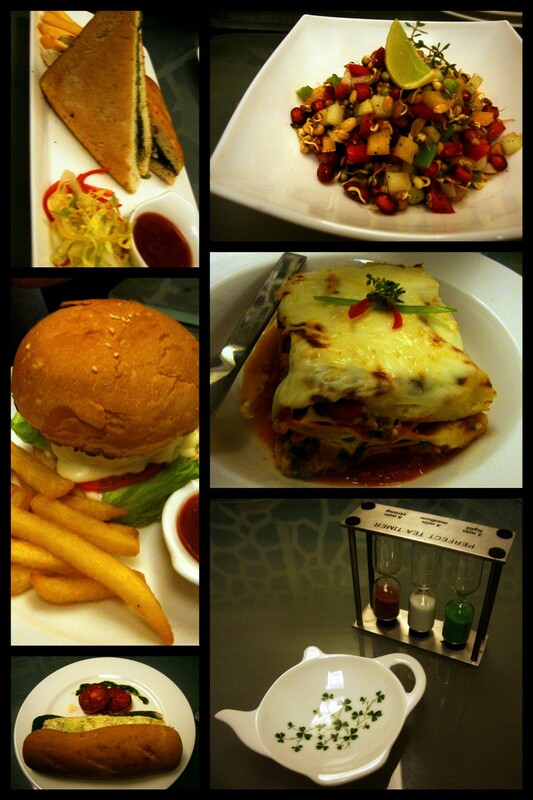 The menu is quite extensive, not restricted to Tea alone. 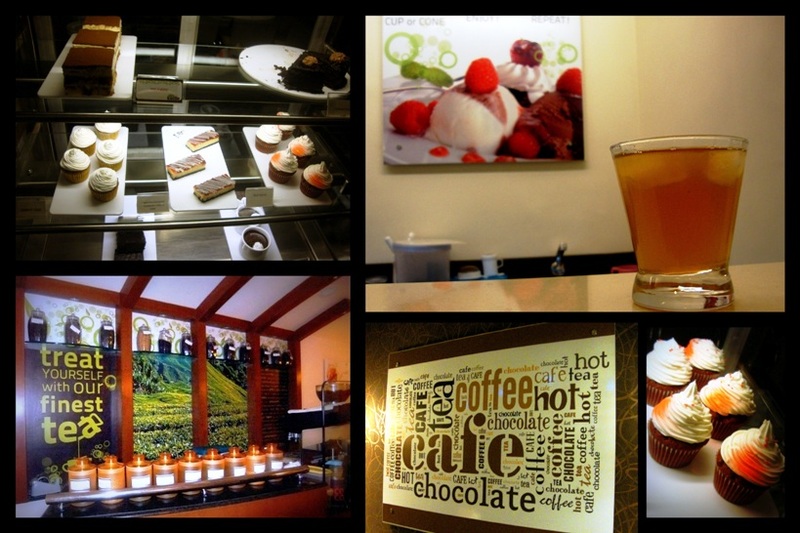 They serve a variety of Pastas, lasagne, sandwiches, desserts and cold stone ice creams. We were welcomed with the Black currant Tea- it was yumm, though a tad sweet for my liking. It was also the 1st time I tried the scones, they were interesting and I did like them, they were served alongside butter and jam. The Tomato Basil soup was a hit among most of us, only suggestion was to use plain butter and not salted button on top. Next up were the salads, us vegetarians got a Sprout Salad - a good, healthy option/also a filling meal/snack. Suddenly i noticed a plate with neatly arranged triangle slices of mushroom on toast, followed by the the egg white omelette served with grilled tomatoes on ciabatta bread (looked more like a hot dog bun), these two were alright! In between the food, I ordered a cup of Chamomille tea that I really liked it especially with honey. Another sandwich we tried was the Pesto Paneer Sandwich - it was alright,I felt the paneer was chewy & dry , and so it was difficult to eat. Wait, we were not done. 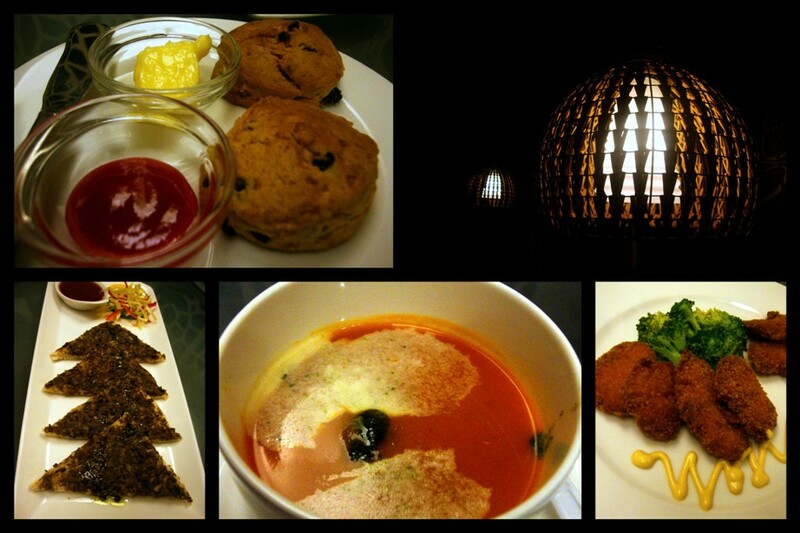 There were a few non veg dishes that floated by, a chicken salad served with banana fritters. Another dish that came along was the Lasagne, which was quite delicious and the pasta stood its ground, but then the Curried Pasta, a Pasta that tasted like an Indian korma, something I've never had before came along making us wonder what was going on in the Chef's mind.. It is good for those who like Indian masalas and flavours. I dint take a fancy to it!! The sips of tea in between the bites was good, kept us all happy and feeling light.The only tea that was bleh was the Organic white tea- it dint have any taste, felt like I was drinking hot water. Wonder why?! A friend infact commented that it was her favorite and normally quite flavorful. "Woah that looks good"- yes that is what came to my mind when I saw the desserts placed on the table. 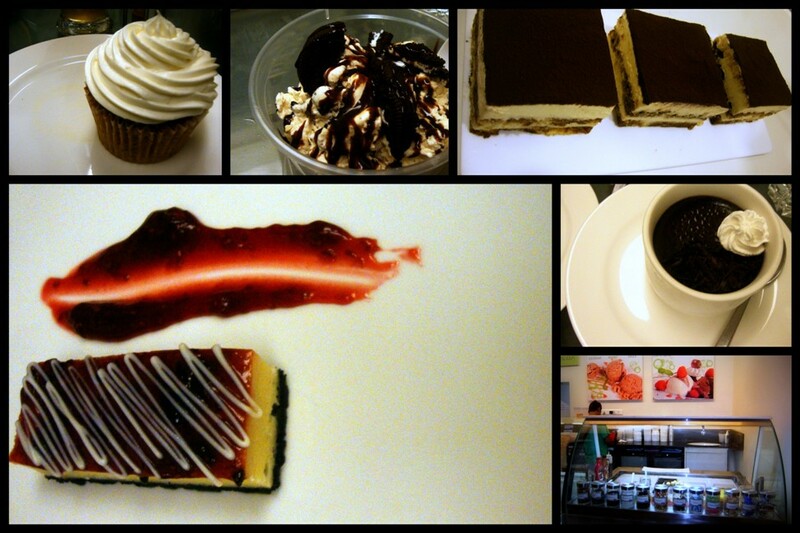 Some of the desserts were excellent. The Tiramisu was nice, I fell in love with the "Love for Strawberry Ice cream" served in a waffle cup and actually liked the Oreo ice cream as well. Oh, how can I forget the Carrot cup cake. The expresso brownie was also good, while the Pot de crème had a weird texture and was not a favorite among the lot. Hang on, I know there was one more dessert, ah yes- White Chocolate Raspberry Cheesecake, it was quite good. 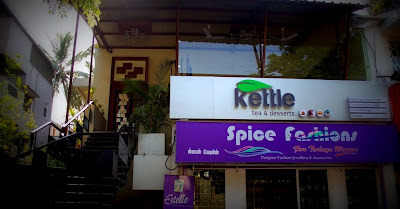 Few other teas that the group ordered were Masala Chai and Assam tea. 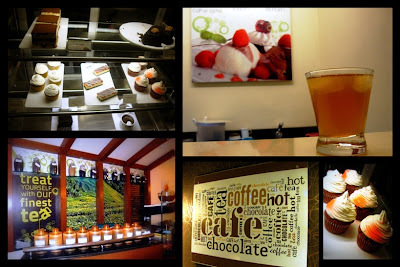 Overall, it is a fun place to hang out or hold a meeting at. Do visit, am sure you will enjoy Kettle.